The United Nations Foundation Board of Directors today announced two new members– Baroness Valerie Amos, Director of SOAS University of London; and Dr. Julio Frenk, President of the University of Miami. Baroness Amos joined SOAS in September 2015 after a 5-year term as UN Under-Secretary-General for Humanitarian Affairs and Emergency Relief Coordinator. There she coordinated humanitarian assistance during a period of rising humanitarian need around the world with 125 million people requiring aid and protection. She is a former Secretary of State for International Development in the British Government and was also Leader of the House of Lords. She was Parliamentary Under-Secretary of State at the Foreign and Commonwealth Office with responsibility for Africa and the Commonwealth. “The spirit of the UN Charter, and its promise to maintain international peace and security and foster international cooperation is as relevant today as it was 70 years ago" said Amos. "The UN Foundation is committed to supporting the central role of the United Nations in securing peace and stability, development and the protection of human rights. It is a privilege to join their efforts and work with my fellow board members to highlight the need for collaboration in our efforts to tackle the world's global challenges." Dr. Frenk is currently the president of the University of Miami and formerly the dean of the Harvard T.H. Chan School of Public Health. From 2000 to 2006 he served as the Minister of Health of Mexico where he pursued an ambitious agenda to help reform the nation’s health system and introduced a program which expanded access to health care for more than 55 million uninsured Mexicans. He was the founding Director-General of the National Institute of Public Health of Mexico and has also held leadership roles at the World Health Organization and the Bill and Melinda Gates Foundation. “We have reached a new global crossroad where, from public health to social and economic inequity to climate change, we are faced with both extraordinary opportunities and real and far-reaching risks," said Frenk. "Our greater aspirations for human advancement depend on our ability to unite in purpose and in practice at the United Nations. I am honored to join the Board of the UN Foundation and to champion collaboration and sustainable development with my fellow members." The announcement of the new Board members was made during the Foundation’s semi-annual Board meeting that was held in Copenhagen to coincide with the Women Deliver Conference-- the largest conference on the health, rights, and wellbeing of girls and women. 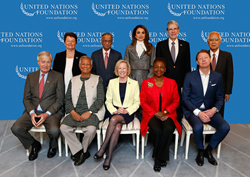 The UN Foundation’s Board of Directors includes some of the most influential leaders of our time, whose pioneering work supports the UN’s vision of a peaceful, prosperous and just world.